Diamond saw blades are metal bond diamond blades with multiple layers of synthetic diamonds impregnated inside the bond matrix. The metal bond is rigidly sintered or welded with a circular steel core. Diamond saw blades are versatile cutting tools that are widely used for cutting a large variety of materials such as marble, granite, concrete, asphalt, building materials and many other abrasive materials. The quality and life of a diamond blade usually depend on purpose of use. • Professional: It is for a large scale of use on a regular daily basis. Durability and fast cutting are both considered. • Contractor or builder: Require fast cutting speed and regular use with reasonable durability. • DIY: Small job or occasional use, fast cutting with reasonable life. • Promotional: Shorter life but cutting well with coolant. 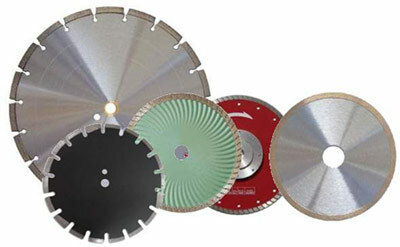 Please visit the links below for different type of diamond saw blades. For more information or inquiry please contact us.